As you have seen in previous blogs we have sent, Wilmington has SO much to offer. We wanted to give you a sneak peek into destinations NSEW (north, south, east, west) of Wilmington. All of these spots are within an hour drive of the Inn. Mount Snow is the closest ski mountain to Wilmington. Mount Snow has lots of fun summer\fall activities such as; mountain biking, golf, scenic chairlifts & more. During the winter time, Mount Snow has 87 trail lifts, 20 chairlifts & 587 acres of land. Besides skiing, they also offer Snowmobiling, tubing & snow-shoeing. Make sure to check out their website for all of their fun events year round. Want to go to the mountain & not worry about driving? Take the Moover- The Moover is a free bus from downtown Wilmington directly to Mount Snow year-round. Known for its fun and funky art vibe, Downtown Brattleboro’s compact, walkable footprint houses an incredible variety of entertainment venues. Looking to shop while you’re there? Among others, Downtown Brattleboro offers: 4 independent bookstores, 3 sporting goods shops, 2 record shops, 4 vintage boutiques, 3 jewelers, and an abundance of galleries, studios, and local crafts folks. All within an easy stroll. If you like to eat and drink, you’ll find Downtown Brattleboro has become a true foodie destination. Specialties range from Thai to Farm Fresh, Vegan, Fine Dining, Italian, and more. A year-round Farmer’s Market, award-winning Co-op, pubs, distillers, artisanal food creators, and 4 local breweries round out the offerings. Visit here to see what they recommend doing if there for a day. Bennington has a rich cultural heritage, beginning with the Native Americans drawn by an abundance of fish & game in & along the area’s numerous waterways. In 1749, New Hampshire Governor Benning Wentworth chartered the first town in the territory now known as Vermont, and named it Bennington, in honor of himself. The town’s original settlement was formed in the area known today as Old Bennington in 1761 by Congregational Separatists from Connecticut & Massachusetts. The independent spirit of these early settlers was reflected in their overt resistance to land claims from New York Colony & eventually led to the formation of a local citizen militia headed by Ethan Allen, which came to be known as the Green Mountain Boys. The Bennington Monument is a great spot to visit to learn more about this famous battle. While there is a lot more to do in this great city, Bennington is a great stop over town before heading North into Vermont on Route 7 Byway. Stratton Mountain is easy drive from Wilmington if you are looking for a change of pace. In the Summer, Stratton offers an adventure park with tons of fun activities for all such as kayaking, hiking, ATV Tours & a full ropes course. During the Winter, Stratton offers 97 trails, 11 lift with 670 acres of land. While visiting Stratton, check out Hamilton Falls. 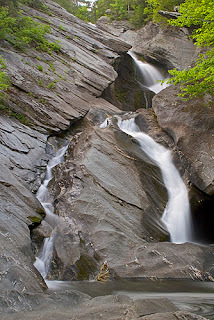 A great natural sight to see in the Vermont- multiple options to hike in from easy to moderate; perfect for all ages. Shelburne Falls is the business district shared by the towns of Buckland and Shelburne. Once a prime Salmon fishing spot for native Americans, the village gradually emerged more than a century ago as a manufacturing community centered around industry on the Deerfield River. The village experienced a revitalization in the 1980s and 1990s, and unlike many similar communities, evolved and continues to be a vital downtown with a growing reputation as an arts community. The village resisted the "urban renewal" trend of the 1950s and 1960s, which has left this generation with an historic, turn-of-the-century setting for a unique mix of locally owned businesses. A vibrant, creative community tucked in the valley of the Green Mountains, where big, undiscovered experiences await. Where you can sip, savor, and shop. Where you can unplug, restore, and recharge. With world-class recreational activities and premiere cultural events at your fingertips, we don't blame you if you never want to go home. Manchester is a town in southern Vermont that homes Hildene, the estate of Abraham Lincoln’s son Robert, which has a Georgian Revival mansion, gardens and a farm. In Manchester there is also The American Museum of Fly Fishing with displays rods, flies and angling-related art. Nearby, the Southern Vermont Arts Center has varied exhibits, a sculpture garden and a performance space, plus sprawling grounds with forest paths. West of town, a trail climbs Mount Equinox. While in town you can also browse designer outlets and locally owned shops. Visit here to see more of all that Manchester has to offer. These are just a few of the easy day trips from downtown Wilmington. Every day we find out about new day trips for people explore! Don’t forget to book soon for foliage (leaves are already turning!) and ski season.